It is only true for purchases you make at the LEGO retail store, when they order it for you thru shop at home....(if they order it , because they are sold out, or they don't carry an exclusive item.) But , you HAVE to order it from a retail LEGO location. This is what I was told from the GLENDALE store. It really is turning out to be a great build! I am finally 200 pages into the manual...my parts are beginning to thin....and I think nearing the end might be bumming me out some. I have slowed my build down some to stretch the fun out. The design team put a lot of thought into this model. I love the death star troopers.....we need about 2 more of those! Still need to figure out shelf space for this thing...it is larger than what I remember seeing in the store. Wow, the box is huge! And heavy. I am now in the midst of sorting, two of the white boxes are still unopened. The picture shows the progress, two hours after opening the outer parcel box. Where are the Baggies? I can't imagine building anything that large! The Baggies are in the trash bin. I needed 4 hours for sorting. Needed less bowls or little boxes than I thought. Now I'm looking forward to start building. First, I'm glad to see most of you have got your DS as for me, I'm still waiting? It's been 2 weeks now and the wait is getting to me, mind you after reading some of the threads here I've got some questions to ask? 1. Is it true there are no numbers on the bag? 2. You only get one sheet of stickers? 3. An exactly how much space (area) does this model take up? I ask these questions because this is a big model make; make no mistake, some of you have said it takes 4 days (evenings) to put together and that being said with no bag numbers you had to sort it first? Also I had thought Lego would have learned their lesson with the stickers, if we must have them to save cost they at least supply us with 2 sets as it's easy to get carried away and put it in the wrong place, then probably ruin it trying to fix your mistake. I have not built mine yet, but I peaked at it. The bags are not numbered and parts are scattered throughout. It is going to take a few hours just to sort. It also just has one sheet of stickers. Allow a 2 foot by 2oot space for display and you should be all right. This is such an amazing looking set. Unfortunetly I need to save up some money before getting it. But I find my self going to the Shop at Home site every other day to look at the set. Hehe it's a bit odd but I like to imagen how it would look sitting on my desk in my office. And that's another issue I need to make room for it before I get my own. How long do you all think this set will be available for? I'd hate to miss getting it. Some have said 4 days (evenings) to put it together .....really.....wow, I'm impressed. Not sure how many hours that is. I've been building mine for at least a week now. Thats about 2 hours or so a night. Seriously.....count the hours you are sorting as well. I really did minimal sorting...may be why mine is taking so long......but building it has really been fun! For those of you who sort your pieces what's your method? Like how do you group the pieces? By color, type ect. I don't normaly sort my pieces before hand. But I think the only big set I've ever assembled was the Blockade Runner. And the SD playset if you count that. I posted a photo, which is a bit above your post. It shows how I sorted the parts. Maybe it helps you. I don't sort pieces and prefer to keep them in their bags. Usually I have no problem finding a particular piece by association, e.g. I remember seeing a black 1x2 brick in the same bag as the grey 2x2 tiles, so when I need the black brick I simply grab the bag with the grey tiles. After a while I know which bag it is even when it no longer contains any grey tiles. This worked really well for the 10179 Millenium Falcon, as the box with its compartments held all the bags like a filing system. I could simply flick through them looking for the one which I believed a piece to be in. This was not possible with the Death Star, as neither the outer box nor the inner boxes were suitable because they only open at the narrow end. My biggest problem with the build was distinguishing the colours, something that other people have also complained about in recent sets. Their depiction in the instructions is not distinct enough. Several times I had to go back and exchange black for dark bley or vice versa because I had used the wrong pieces initially. Whenever a trans orange tile appeared I was worried that it might actually be one of the few trans red ones that I had seen in one of the bags. Size: The completed set will easily fit in a cube with 20 inch (50 cm) sides. S@H says it is 16 inches (42 cm) wide, but the superlaser does protrude quite a bit. 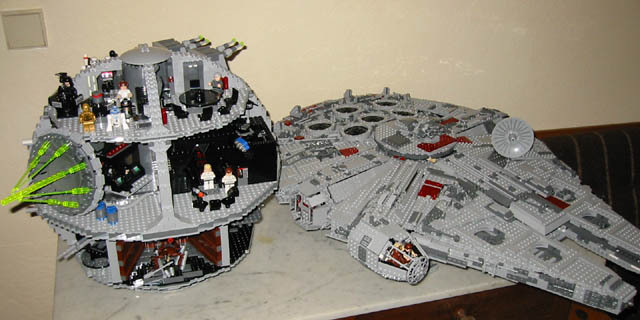 Even so it takes up a lot less room than the UCS Falcon. aww, the Tie Advanced is soo cute! But has anyone an idea how to mod it, that Vader can see out of the window, even if he's too lazy using the force? I group them all by type and colour of brick. Example, all the 2 by 4 light grey bricks in a pile. It takes up alot of room, but I find it works the best for large sets like this. Ty for the pic referance Andi looks pretty well layed out. I copied that pick and put it in my artist source file under LEGO on my comp for referance later on when I get my own DS play set. And yeah DestructiveDelirium, I've never presorted my pieces before. I usualy use Gingerbeard Man's method of keeping them in piles based on the bag they came in, but I think that this set when I get it will require a better organization for the build. At least I know I will probably thank myself later if I do some prep work first. I find with most bigger sets, the bags have a general sorting already done for you. Which is what I go by. For the most part this is true with the DS set, but there are many bags with a variety of piece types and sizes in them. Additional sorting will still be useful. I used the exact same method to build my 10179! Although for some of the small parts, I dumped into a small tray. It's easier to pick up 1x1 round plates from a tray rather than from within a small bag. does anyone know if there are any coupons out there for shop@home for free shipping- or any other site that sells it with free shipping- its a shame that lego doesn't make the big ticket items free shipping, cause im sure on this beast- shipping is probably $40 or more am I right? Why is shipping so expensive by you? I paid 4.50 Euro for shipping. I actually thought $25 was pretty good since the package weighs in at around 20 lbs. Even though I am on the West Coast and the package was most likely shipped from the East Coast, I am fairly certain that the $25 is a flat rate. Anyone want to back me up on that? Sounds like you got a good deal on shipping, Andi! Was it from a retailer or a LEGO S@H? All of the shipping and handling costs are listed on the S@H website. For those in the United States, orders between $350-500 (which the DS is), shipping is $24.95. I've found that in the months leading up to Christmas (perhaps part of October, and definitely November-December) S@H has offered free shipping on orders over $100 in the past. I would be very surprised if they didn't offer the same this year. If my understanding is correct the $24.95 standard shipping charge includes Alaska and Hawaii. So buyers on the East Coast are effectively subsidising those on the West Coast and beyond. In Germany S@H only has three shipping charge bands. Orders below EUR 20 cost EUR 2.50 to ship, between EUR 20 and EUR 75 shipping is EUR 3.50 and orders above EUR 75 ship for EUR 4.50. So it's hardly worth fretting about. With hefty sorting I needed about 24 hours for assembling.